The most common PS4 games to experience this problem are Grand Theft auto V, Call of Duty: Ghosts, Payday 2, Battlefield 4, MLB 16 (Major League Baseball), NBA 2K16, Fallout 4, e.t.c. First, it is important to understand what this PlayStation error means and why it happens. This will help you troubleshoot more productively whenever you are presented with a similar error code. 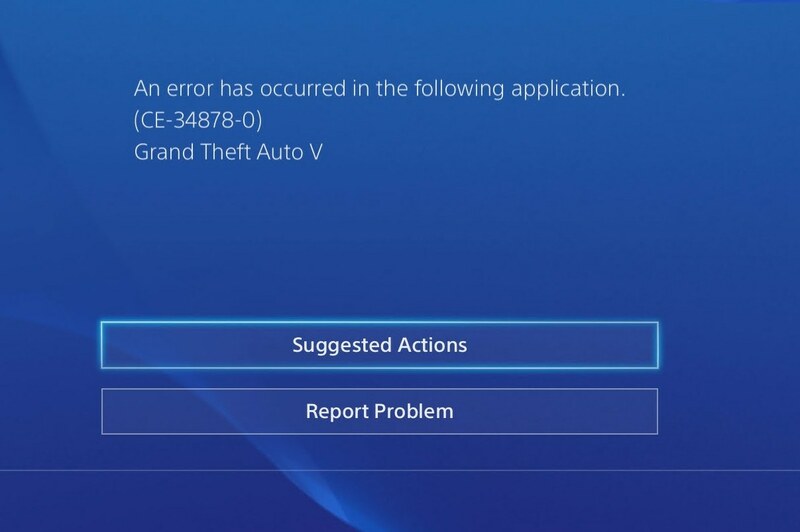 The CE-34878-0 error on PS4 signifies that there is a problem with either a game file or a system file. This usually means that the game has not been properly optimized to run in the conditions you are playing in (this could be software version, network speed, console variant, e.t.c), and would require some patching for it to work properly. That is why it is common with new games. This could also mean that one of your save files (if this isn’t your first play) is corrupt. Finally, I know of someone who started experiencing this problem when they pulled out the power cable without shutting down the console properly – leading to a corrupt system file (fix 5). Now before you do anything, read through the fixes below and try them as they appear. Good luck. This is NOT the same as re-installation (discussed in fix 5). Check if an update / patch to the PS4 software was released recently. For example, a system update was released 5 days ago on June 21 here https://www.playstation.com/en-us/support/system-updates/ps4/, so if you haven’t updated your PlayStation recently, you should do so first before trying other fixes. I am certain that quite a number of people have destroyed their game consoles with a hammer because of a problem that would have been taken care of with a simple reboot. Turn off your PlayStation console (making sure that it shuts down properly), unplug the cords, and wait for 5 minutes. Now plug everything back and restart your game. If you still run into the CE-34878-0 error, take a look at fix 2 below. If you just got this game and haven’t played yet, it might be worth downloading again. Perhaps your first download is corrupt. also, I would like to mention that some people have claimed that deleting the game and all their saves, then re-downloading the game anew has worked for them. You might want to try this if you haven’t spent the last two years stashing virtual cash in your account. Check to see if a patch has been released recently for the PlayStation 4. If there’s no patch, try re-installing the system software BUT be sure to backup your files and saves because once you re-install the system software, your progress from every game will be wiped, so this should be your last resort unless you are able to backup your saves. Go to ‘Settings > Initialization > Initialize PS4.